Posted by admin in natural hazards, not-a-volcano, Peru. The strange event occurred at approximately one in the afternoon, affecting about 20 hectares of farmland, where at the moment of the explosion there were people working their lands with their animals, who have been buried. The mayor of San Luis de Lucma, Santos Delgado Fernández, said that there were at least 100-150 victims after the blast, the majority residents of villages around the scene of the incident. ‘They have lost crops and animals’, he said. Local inhabitants said that after the explosion took place the area was transformed into a dust cloud, putting the health of hundreds of locals at risk through the emanation of smoke and sulphur that can cause asphyxiation. Landslides are not uncommon in Peru and can be deadly, particularly in the rainy season (a fatal landslide occurred last month in the south). 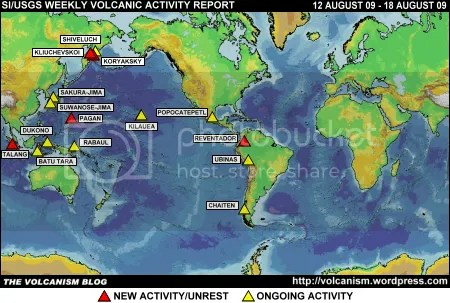 This area of northern Peru has no history of volcanic activity so the fears of a volcanic eruption are almost certainly the products of panic and a misunderstanding of the nature of the event. The local head of Civil Defence, Miguel Alva, is quoted as saying that this was a landslide, and that it is not uncommon for landslides to generate ‘a large cloud of smoke’. Similarly, the director of seismology at the Instituto Geofísico del Perú, Hernán Tavera, has affirmed that this was a landslide caused by recent rains and not a volcanic event: ‘There is no volcano in the country north of Ayacucho’. The blast and smell of sulphur, Tavera says, would have been caused by the disruption of thermal springs in the area of the landslide. The landslide has disrupted local water supplies and affected a nearby hydroelectric plant. Around 300 people were affected by the event, and latest reports say that eight people are missing and five houses were buried. Posted by admin in El Misti, NASA Earth Observatory, natural hazards, Peru. 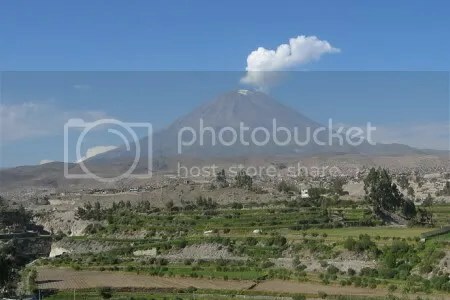 The Peruvian volcano El Misti is very close to the country’s second city of Arequipa: just 17 km separates the city with its ~1 million inhabitants from the volcano’s crater. The image above, a mosaic of two ISS astronaut photographs that is today’s Image of the Day at the NASA Earth Observatory, shows the potentially dangerous relationship clearly. Larger versions of the image, and a full commentary, are available over at the Earth Observatory. 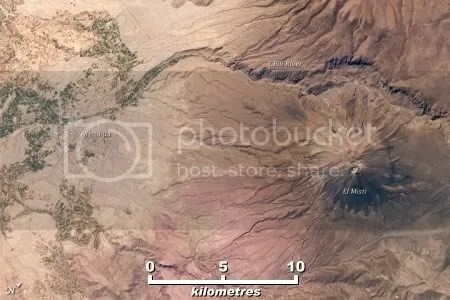 There is, however, no scale bar on the Earth Observatory images, so I have added one to the small version above.